Fact: Pharmacy benefit managers (PBMs) leverage competition and negotiate rebates from drug manufacturers to lower drug costs. How Do Prescription Drug Rebates Reduce Costs for Patients? 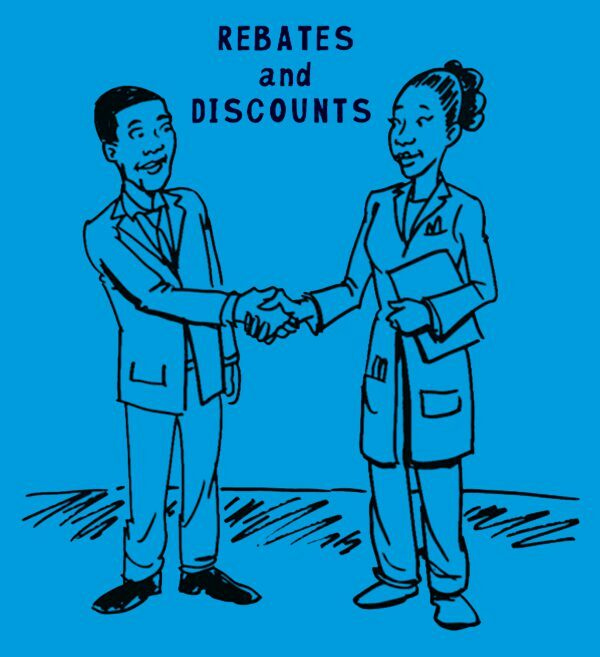 Manufacturers choose to negotiate discounts on drug prices with PBMs using rebates. These rebates are used by payers to reduce premiums and out-of-pocket costs for patients. Some drug companies try to shift blame for higher prices by blaming the PBMs who negotiate rebates and discounts on behalf of employers, unions, and government programs that offer coverage. This makes no sense. Would anyone believe a TV manufacturer if it said its price hikes were due to aggressive discounting and rebating by a big box retailer? Furthermore, a new study debunks the notion that the prices drugmakers set are contingent on the rebates they negotiate with PBMs. Ironically, many higher priced drugs involve little or no such rebates. 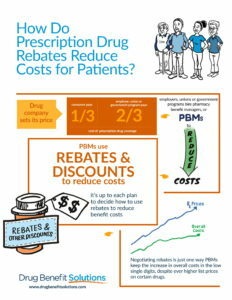 In the commercial market, PBMs help payers implement Point-of-Sale (POS) rebates. However, POS rebates are unworkable in Medicare Part D and pose risks that could destabilize the program. In fact, they are allowed in Part D and have been tried unsuccessfully in the past. They lead to significant adverse selection and expose plans to other risks, such as False Claims Acts violations if they incorrectly estimate the size of rebates. Typically, 90 percent of rebates are passed back to the plan, employer, union, or government payer to lower premiums or other cost sharing. If one PBM is not getting the best deal, the employer or plan sponsor will find another PBM that will. Only 1-in-5-voters buy the drugmakers’ “rebates cause high prices” message. Consumers are well aware that drug companies set drug prices, and they know higher prices mean higher out-of-pocket costs. Premiums would rise by over 50 percent if Medicare Part D plans are prohibited from negotiating rebates on brand drugs. Among the top-selling brands in Medicare Part D, there is no correlation between growing prices set by drugmakers and the change in rebate levels that they negotiate with PBMs. The growth in the price of cancer medicines in the U.S. averaged 3.6 percent last year, a drop from 4.7 percent in 2015, after accounting for rebates and discounts that drug makers paid to health insurers, according to a new IMS Institute report. A new IMS Institute report found that discounts, rebates, and other price concessions negotiated by PBMs on brand drugs reduced spending by an estimated 28% to $323.1 billion last year, and average patient out-of-pocket costs declined from $9.66 in 2013 to $8.47 in 2016. Heightened efforts by health plans and pharmacy benefit managers to limit price growth, resulted in concessions that reduced price increases on an estimated net basis to 2.8 percent, significantly lower than in prior years. Across twelve therapy classes widely used in Medicare Part D, medicine costs to plans and patients are 35% below list prices and net costs to Medicare Part D plans alone range from 46 to 69% below list prices. PBMs are using competition between products to more aggressively negotiate drug costs. This is putting a downward pressure on the growth rate of total healthcare spending. In contrast to the heavy hand of government regulation, private drug plans and pharmacy benefit managers (PBMs) compete to achieve lower costs, promote use of generics, use formularies to promote more affordable brand options, and offer other beneficiary-friendly and cost-savings tools. “Mylan is simply the latest drug maker trying to re-frame a pricing problem into a coverage problem,” said Mark Merritt, president of the Pharmaceutical Care Management Association.